After a packed two-hour lecture at Napier University yesterday it was great to get chatting to some of the students afterwards in their practical seminar. What emerged was that there is so much to learn in new technologies, even for these software engineers, network analysts and business analysts, the specialists of the future. Degree courses by their (current) nature silo information so much that they can be experts in one thing, and know nothing about a potentially related technology. For one small group, spending 20 minutes having a play with RSS feeds for the first time turned out to be a real thrill, especially since it's so much easier to manipulate than when our school was producing its first podcasts three years ago. I had great fun finally getting some more time to play with Yahoo Pipes, whose way of showing you where all your bits have come from is particularly charming. John Johnston provided a plethora of homemade products, from his del.icio.us links, which are normally pretty ugly to look at, being fed through into a prettier Tumblog, to the ScotEduBlogs aggregator, produced with Robert and Peter, which brings together educational blogs and allows users to subscribe to blogs coming from particular locations around the country. John also showed how we can take the tag of an event, for example, and create a portal around that in a few clicks: this is one for the TeachMeet07 event. Likewise, David Warlick pointed to his Hitchhikr, which aggregates information on a wide range of conferences. Elizabeth came up with a portal around all recent things to do with the Wikinomics book, and a digital ethnography portal which would be useful for anyone trying to get under the skin of why we love these new technologies so much. LTS and Glow colleague AB points to an app that allows YouTube homepage to be used in a flash environment, underpinned by RSS, while Will pointed to his Darfur news portal, bringing information, pictures and video from there and, at the moment, Tibet. Finally, Caroline points out new service FriendFeed, which aggregates your life and the lives of your friends, in one page. What are your favourite examples of RSS being used in useful ways? Let us know; I'm sure the developers of tomorrow would appreciate your tips. Twice in the past two minutes I've had an "a ha" moment as I finally place the people behind blogs that I really enjoy reading through my anonymising blog reader each day. You see, that's the problem with a feed reader: you miss all the design, quirks, feel and emotion that people put into the look of their actual web page. First up came a search through the feed reader for continued discussion of this week's Naace conference in Torquay. This led me to realise that Memex 1.1 from my feed reader was, in fact, John Naughton, whose keynote preceded mine on the first day of the conference. I didn't agree with everything he said, and brought it up in my keynote. He doesn't know this, perhaps, and doesn't mention it in his own blog. Alas, the discussion will never happen, I will never have my own mind swayed, since his blog doesn't allow comments. A shame. Another connection lost. The second "a ha" is of a far more conversational variety. While Twittering away that I was happily in my new hotel room (as in it was still being built as I arrived), one AmyPalko gets in touch to ask if I'm still around, as she's finishing off some PhD work down in my old office building at the university. I flick onto her Twitter profile to remind myself how I know this virtual connaissance, click through to her blog and realise that hers is one of my favourite design/photography/cool stuff blogs. I'm currently listening to a recent "Oistrakh plays Debussy" video that she posted a few days ago. Listening for the sixth time. For me, decision-making isn't just based on what information comes through to me, but also about the conversations around that information. My contribution to the discussion was a request for email with no reply button, a way to get the information sent by Ned Luds in email out into the open for discussion by the rest of my team, group or community. My biggest problem with current aggregation type services such as Netvibes and Pageflakes is that they merely create new boxes for old stuff, emperors with new clothes. Even when presented with feeds and flows of information, people will always lower themselves to the common denominator of email if it is offered to them, despite the fact that they will also complain about being submerged in email. Email with no reply button is maybe just a simplification for what I do when emails arrive at the moment. Often email isn't just for me, it's for someone or some people in my entourage or in my blog readership. I manually take it out and add it. Unfortunately, being Ned Luds, the original senders probably don't see the ensuing discussions on the blog. We also talked about having the ability to temporarily switch off information when we see that it's just getting in the way, but might be useful 'someday, maybe'. Geographically-centred information, friends', contacts' and colleagues' information, team-mates' information, CEO's information... we can subscribe to it all and more, but we need a way to swiftly switch it off to aid our comparison analysis of information. Ideally, of course, information to which you already subscribe should only come to you at the time you are seeking it for your decision. So we ended up designing one search box on a page into which you type your decision-making question, but instead of the response being random search, the returns are based on those people and that stuff to which you have chosen to subscribe. Do it first. Make trouble. Inspire change. Jim in The Highlands was quick to note Channel 4's move from £6m per year on educational television programming to a large part of £6m per year on online educational programming. Is educational TV dead on C4? Not quite, but it's certainly undergone some serious surgery to make it recognisable to a 2008 teen. Channel 4 is certainly living up to its mantra: Do it first. Make trouble. Inspire change. And I'm glad to have been part of it. Yes, it's a bold experiment, but no, it's not to 'cash in' on anything. It's just using the web because that's what teens and tweens use most, and using the web that they use (adults tend to call it Web 2.0, for them it's just the web). As Channel 4 remains one of the few television channels in the UK to engage the tricky 14-19 age group (the only one?) this is just one more set of innovations in 25 years of innovation. "In all conscience, Channel 4 could not continue to spend £6m on programming that is not engaging people." Socially networked, playful, participative content is the only way we can create successful media to engage, motivate and inspire young people "on the box". The box these days is more likely to be a Nintendo DS screen or PC. Matt and Alice, the commissioners, are both avid gamers, keen on everything from the world of alternate reality games to playing Zelda on the Nintendo DS. Working through some ideas with them on the Board has been a pleasure, and expanding on some of the ways we can engage young people on this 'slate' of programming as been incredibly challenging. The new 'programming' online is playful. That doesn't mean that it's trivial, but rather it's about getting young people to participate in the project, create the programme/site/knowledge/learning together. Teens will be encouraged to do this not on some mothership Channel 4 site, but rather on their own Bebos, blogs and Photobucket sites. It has a strong social element, so that teens are constantly part of a feedback loop on what it's like to grow up in 21st Century Britain. It's about 'playful exploration'. "The BBC tells you what you need to know. Channel 4 helps you ask the right questions." I know that Matt and Alice have had to do a heck of a lot of work to convince production companies to change the way they pitch, propose and structure these much more playful, explorative, social 'programmes', where the TV programme might come as the end result of a year's online learning. Gaming projects include City of Vice by Littleloud, which invites the user to solve historical crimes from Georgian London, and Six to Start's project The Ministry, which explores privacy and identity online. Roo's been great at posting the audio and some visuals from last week's panel session where I moderated on how organisations could and should harness the 'Facebook generation'. He had quite possibly the best quote of the week: "World of Warcraft is the new golf", courtesy of Joi Ito. You can see and hear Roo's excellent presentation on virtual worlds and how he and others have been using them at IBM, listen to my 20-minute rant on how we should harness the Bebo Boomers in our organisations instead of having them make the coffee and Mary Ellen gives a wonderful overview of the importance of playing instead of training (her slides are here). It's worth tuning in, too, to the panel Q&A that had been conducted both on Twitter, the blog and F2F. You know the efforts of thousands are paying off when Learning and Teaching Scotland, the education agency in Scotland, feature in their news roundup a report by the British Council on why everyone really should start reading their news, social network and blog information through Netvibes. A great thumbs up from the Establishment for Tariq. If you want to find out more about Netvibes and how you can make sure you never miss a post of edu.blogs.com and other blogs by using it, then head over to my wee guide. Even more handy now that they've improved on the mobile version of the feed reader. The need for schools in the UK and Ireland to educate children on what self-publishing means rather simply than ban the tools, has never been higher, as Bebo are on the verge of opening up their platform to developers. By following Facebook's lead in allowing developers to create their own applications to work within the teen social network, Bebo is set to see a similar explosion in the number of users and the amount of use - more, perhaps, than the current 41 minutes of time spent each night by the average UK teen. The ultimate aim, to keep Bebo alive. But there's a huge difference between Bebo and Facebook that makes this move smell a little fishy: the average age of Bebo's users must be about half that of Facebook. The move to open up means that the information placed online by teens, both before now and from now on, will become far more spreadable, far quicker. Applications ask for permission before being used but what they do with your information after that point is unpredictable: one case in point, from Facebook, the number of people who appear to be suddenly happily married or, worse, divorced from their better halves [How Facebook ended my marriage]. Potentially, a new application installed on your page could start to replicate your data out of context elsewhere on Bebo, for public consumption, in much the same way as some Facebook apps have done. Adult users of Facebook, 'expert users' like Crampton, even, have already had to learn to navigate this open-ended app-filled social networking world the hard way. How much we are willing to let kids explore this on their own, in the wild, and make their own mistakes the hard way is another matter, when the consequences are arguably greater. How Bebo pitch this to their younger users will be an important factor, too, for educators wanting to plan digital literacy into their work. So, if you are a teacher in a UK or Irish school, the latter a country where Bebo has 95% penetration in the teen market, don't hang about for Bebo. You need to start thinking about how you are going to educate your students in the art of self-publishing without signing away their content, their private information and their online life. What Bebo want to do is not 'bad' per se, but it's open to misunderstandings and mistakes will be made by young people who don't know how to play the game because they haven't been told how. Are you going to ban or are you going to educate, Teacher? A few months ago I spoke at the National College for School Leadership, keynoting the ICT for Primary Leaders of the Future part of the course. The talk was based around the five "usual suspects", the factors I believe are vital to comprehend in order to engage our learners to their full potential. At the end, however, I outlined four challenges for these future leaders of change in the schools system. I don't know how many leaders read my blog, but if you do or know someone who is, then feel free to send this as far and wide as you think it's worth. I think there are some messages a few more leaders could take on board. Firstly is the greatest skill of them all: know when to teach, know when to stand back and listen. You're a leader, not an expert in everything. You're likely not an expert in social media to the same extent as some of your staff and certainly your students. If someone else can do it better, let them explain how it works. Paraphrasing some arguments you don't really understand will only make people feel the message is that little bit weaker, and those who feel they should be there leading things, too, will feel that their ideas have not been recruited (Corante). (Great managers teach (when they should; Lifehack). Second, you've got to participate if you are going to engage with others in the the ways social media and gaming can help improve the education of our young people. It's not good enough for leaders of change to pay lip service to these seismic changes - the students, for one, will smell you out for the lack of interest in the thing that interests them the most. Do you want to give an internet safety talk? Get yourself on Bebo for eight weeks and see where the real dangers lie (and they're not where you expect them). Going to tell us how much potential Facebook has for education? Not until you've been on there long enough to see where the potential really lies. Importantly, if you are going to encourage this in your school you've got to, for a while, be the most regular commenter on school blogs, Flickr streams and wikis. Participate, participate, participate. If you do it, the sharing culture you're looking for will largely take care of itself. 2. 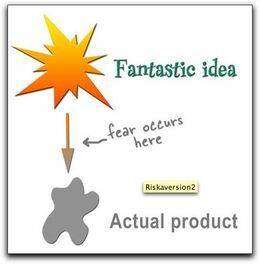 Death by risk aversion? Does this describe your school or management environment? The phrase comes from Kathy Sierra's post of the same name. She uses the analogy of the Roomba process, whereby good things happen to those that don't plan it that way. We can only go one step at a time before seeing what the next step might be. Planning out all the steps in advance means risking a loss of creative spark that creates the next achievement, that unturns a stone you hadn't noticed before. Hugh asks if you are "owned by Wall Street", if you are only as good as your last financial quarter and anything else means that silly social media project you're doing will be killed. The notion that a school's aims be dictated by a private bank of investors is abhorrent to most yet, every time a leader starts to avert risk, taking into account only the negatives, it's equivalent to being run by a bunch of faceless investors. Who is telling the leader not to do something? Who is saying that it's too risky? The thing is, no-one probably is. It's rather the expectation that the faceless investors (parents who don't know about the idea yet, press, staff who only engage when they are complaining) will revolt. On the contrary, the more control exercised by a leader before an idea finds its wings the less trust they will garner in the longer term from their staff (link to Dave Weinberger). There are some symptoms you can look out for before it's too late. The blog post that you write is only the stub of a conversation, remember, so open up the comments to let the conversation be in a place that you can see and in which you can participate. Not opening the comments up to the public is a common leadership decision and, on closer interrogation, it's because there is a genuine fear of fast feedback. Leaders like time to prepare their justifications, even when the walls are falling down around them. Blog comments are just a little too publicly fast. If you don't open the comments then nobody will say bad stuff on your blog, but they will be saying it elsewhere. You just won't know about it. Schools are normally great places for viruses to spread of both the medical and vocal variety, yet when good stuff happens it's hard to get the word to every kid, parent, aunt and uncle in the school community. The role of leaders in spreading the word about good news, through technology in particular, cannot be underestimated, yet some leaders have debatable communication skills at the best of times (think of the last PowerPoint you witnessed from one of your leaders). There will always be glowing examples of open, online communicators in leadership, the first or early adopters, yet they may not take on the next stage in the process - employing the ideas of the other early adopters around them, finding cohesion. East Lothian's Head of Education provides one example where leadership in online communication from the top has helped reduce the permissions-based culture for those 'underneath', although there are still some pockets where permission is clearly felt necessary. Have a single clear mission by finding the core of what you do and ridding the noise and chaos that no doubt currently surrounds it. Putting a man on the moon before the end of the 60s seemed like science fiction, not science. Break down misconceptions of what is and is not possible. Don't abstract - put forward notions with which no-one can quibble: Man, Moon, Decade. The man on the moon idea came from a President's mouth. Leaders have to lead by making informed unexpected decisions. They have to know the detail of what is being proposed, too, which means becoming more expert than they have been in new domans. Appeal to the aspirations and emotions of people, and take off that analytical hat. Does your education leader want your region to be the best education region in the world? If not, why not? The man on the moon story is all about overcoming obstacles, and has inspired many other stories. Make sure you have a story to tell if you want to lead others with you. "Our mission is to become the international leader in the space industry, using our capacity for technological innovation to build a bridge towards humanity's future." "We're going to put a man on the moon within a decade". I know which one I prefer. Has anyone done "100 innovative ideas in 100 days" at their school yet? Learn how to communicate effectively, without the meeting request and memorandum (think about Google's 20% time and efficient creative meetings). Learn how to present this stuff to people. Lots of people know the stuff, but very few have worked out a way to explain it succinctly in a way that people can feel and use themselves. Sustainability: "Sustainability does not simply mean that it can last (£). It addresses how particular initiatves can be developed without compromising the development of otheres in the surrounding environment, now and in the future." I'm giving an hour-long intro/demo to searching the web and using RSS to East Lothian ICT Coordinators this afternoon (4pm at Prestonpans Education Centre) and have started to populate the support wiki with some ideas. I'd be grateful if anyone has extra ideas or good resources can add them to the page to help support the staff further. The ICT Coordinators are a crucial group of educators and managers in the authority, able to help persuade staff to come on training sessions or create their own in-house training sessions on the issues we cover. There is a dedicated CPD session on this subject later in May, so the potential to have a relatively big impact in some schools is there. For me, RSS is the only way anyone will ever be able to cope with the huge amounts of information on the web. Today I am very much starting off with an efficiency angle, but feel that the educational uses, especially in current affair-led subjects such as Modern Studies and English language, its potential is much more than mere efficiency gains. If you haven't a clue what I'm talking about I look forward to meeting you on May 24th's training session to help you become among the fastest surfers on the web!